Complete listing of janka ratings for exotic and domestic hardwoods. The Janka Test is a measure of the hardness of wood. The Janka Test was developed as a variation of the Brinell hardness test. 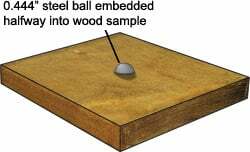 The test measures the force required to push a steel ball with a diameter of 11.28 millimeters (0.444 inches) into the wood to a depth of half the ball’s diameter. The diameter was chosen to produce a circle with an area of 100 square millimeters. The Janka hardness values have been indicated below for your reference. Janka Hardness is measured in the following units: In USA the Force unit is pounds-force (pounds-force is shown below), Sweden:kilograms-force, Australia:newtons.